Yet, education and the way it is delivered is rapidly changing. The invention of smart phones, low-cost tablets and laptops and other devices capable of getting an internet connection are having an impact on the way people access and receive an education. While face to face interaction and engagement with one’s teacher and classmates in person is still considered important, not only for educational purposes but many other social development reasons, it is becoming increasingly easier to be educated online. Coursera, is just one such example, of an online platform providing education to thousands of people around the world for free or at a low-cost. 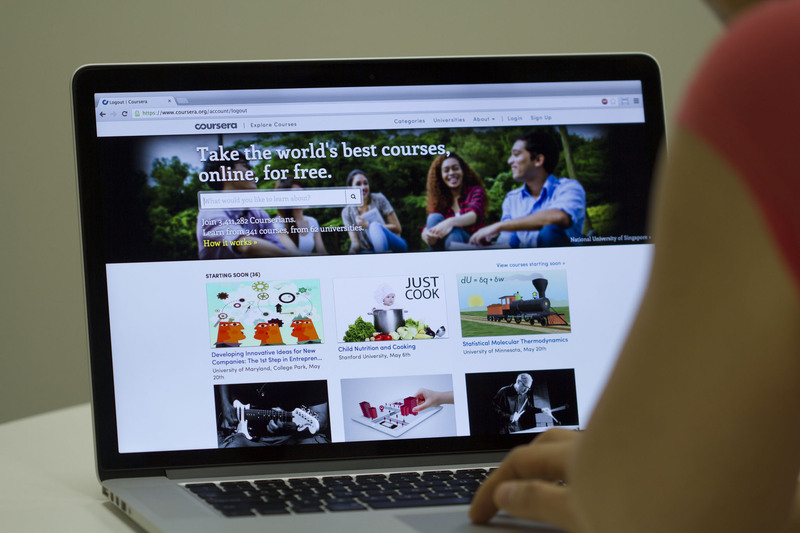 It is now the world’s largest provider of Massive Open Online Courses (MOOCs). Founded in 2012 by Stanford Professors Daphne Koller and Andrew Ng, Coursera has developed into “a platform where anyone, anywhere can learn and earn credentials from the world’s top universities and education providers.” Originally Professors Koller and Ng just offered their own Computer Science courses online but quickly realised that in doing so in just a few months they could teach more learners online that they could “in an entire lifetime in a classroom.” Since then an increasing number of universities worldwide have partnered with Coursera in order to offer MOOCs and specialisations in the following areas: Arts and Humanities, Business, Computer Science, Data Science, Life Science, Math and Logic, Personal Development, Physical Science and Engineering, Social Sciences and Language Learning. Free to sign up to, Coursera account holders, can then again access to a wide range of resources while completing MOOCs and course specialisations, including lecture notes, teacher videos, photographs, case studies, industry and research reports and interviews. They can be accessed in many different languages and often with subtitles. Once signed up to a particular MOOC, a Coursera ‘student’ can also engage with students of all backgrounds, nationalities and ages on the online platform. Often this is actively encouraged through peer to peer reviewing and grading of assignments, essays and other student submissions as part of the grading requirements and on Coursera’s community discussion forums. Speaking in 2014 and acknowledging changing education trends and delivery methods, United States President Obama, gave his support for teacher development MOOCs. In doing so, he approved a scheme of 50 professional development courses for teachers across the United States, including three MOOCs offered by the University of London International Programmes and delivered by Coursera. They have been offered to over three million teachers across the United States, because according to Obama, “all the wireless devices and fancy software in the world won’t make a difference unless we have great teachers in the classroom.” Furthermore, the certification received for successfully completing the online courses will be officially recognised by the US government. Whether you’re a high school student, a casual learner wishing to learn about a new subject area or topic purely out of interest or a young professional wishing to obtain a full university degree it is likely that Coursera will have a course or specialisation of interest to you. Go online, create an account and explore the increasing number of courses that can be taken on your cell phone, tablet, laptop or PC.